This package is exceptionally good value. 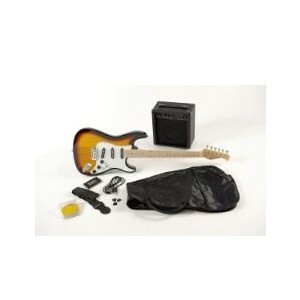 The pack contains a Westfield ST style electric guitar in either black of sunburst, a 10 watt amp, bag, strap, lead, tuner and plectrums. 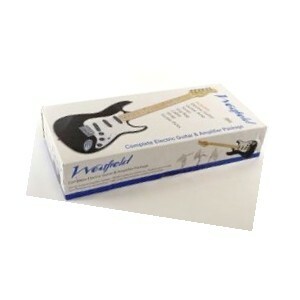 Westfield ST style electric guitar - available in black or tobacco sunburst. Fitted with three single pick ups, maple fret board, 5 way selector switch, two tone knobs and one volume knob, tremelo arm. 10 watt amp - with clean and overdrive control knobs, treble and bass equalization knobs, jack input for guitar, jack input for tape/CD, head phone socket. Also included - bag, strap, lead, tuner and plectrums - plus an amp. The image is that of the sunburst package; black is also available as a colour option.